Six student interns graduate from Project SEARCH, a partnership across government agencies and the private sector. 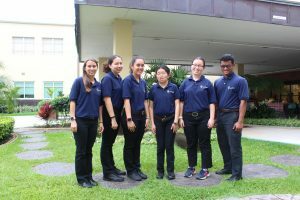 HONOLULU – Rehabilitation Hospital of the Pacific (REHAB) is the first organization in Hawai‘i to launch Project SEARCH, a one-year program aimed at helping secure competitive employment for people with disabilities. In partnership with the Hawai‘i State Department of Health, Abilities Unlimited, Department of Human Services Division of Vocational Rehabilitation and Kalani High School, REHAB serves as the host location for six student interns with developmental or intellectual disabilities and provide real-life work experience, training in employability and independent living skills to help make successful transitions from school to productive adult life. Students participating in the program, which started on August 8, will be interning in food services, groundskeeping, outpatient reception, housekeeping, linen/laundry and materials management during the school year. The six student interns graduate today, Thursday, May 31 at a ceremony at REHAB. The students are thrilled to be graduating from this program and ready to use their new skills that they’ve learned to develop their professional experiences. Project SEARCH was developed at Cincinnati Children’s Hospital Medical Center, a research environment that fosters visionary thinking and innovation. The program has grown from a single program site to over 300 sites across the United States, Canada, England, Scotland, Ireland and Australia. As the only acute-care rehabilitation hospital in the islands, REHAB earns national achievements and recognition for its exemplary patient care and continuum of inpatient and outpatient services for individuals recovering from cognitive and physical disabilities.